Hey everyone, today I’m sharing my review of the Kama Ayurveda Eladi Hydrating Ayurvedic face cream that I’ve been using for the past 2 months. Kama Ayurveda is one of my favorite beauty brands and I totally love their products especially the Coconut oil, Almond oil, Neem oil and Sesame oil. 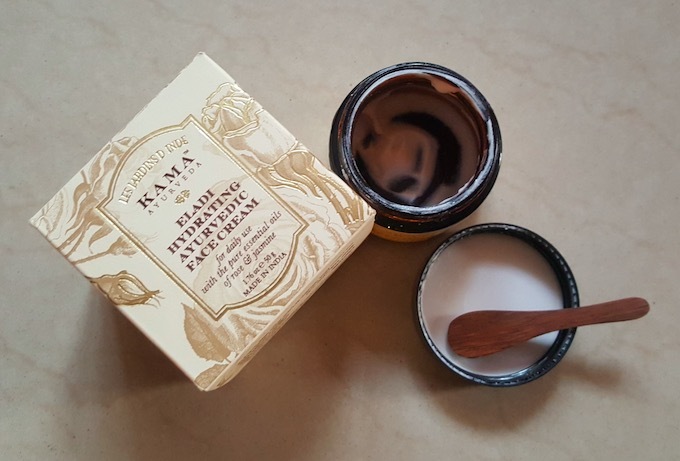 Packaging: Kama Ayurveda Eladi Hydrating Ayurvedic Face Cream comes in a brown colored glass jar with a black screw cap. All the product related information is mentioned on the jar as well as on the outer carton. 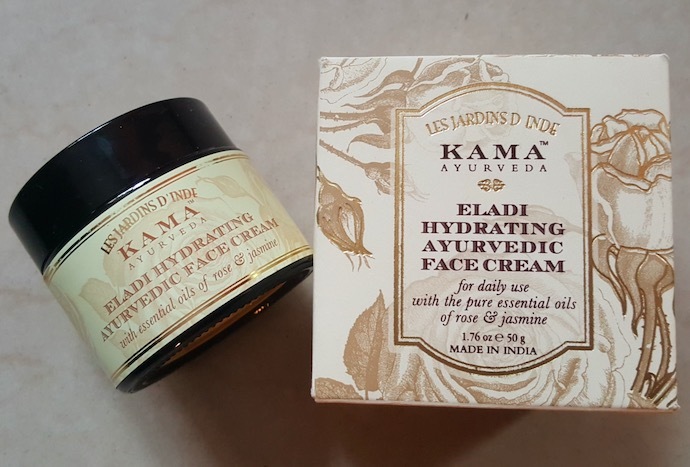 Price & Availability: The price of the Kama Ayurveda Eladi Hydrating Ayurvedic Face Cream is Rs.895 for 50g. 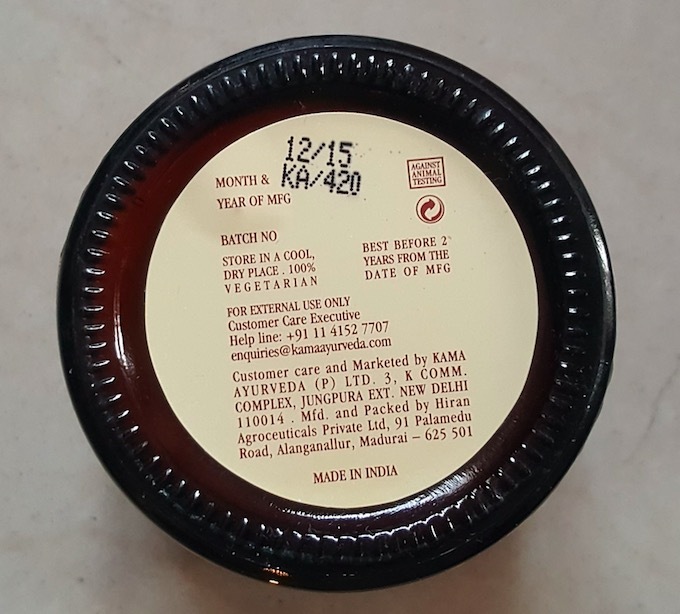 It can be bought offline from Kama Ayurveda outlets and online from leading e-commerce websites. 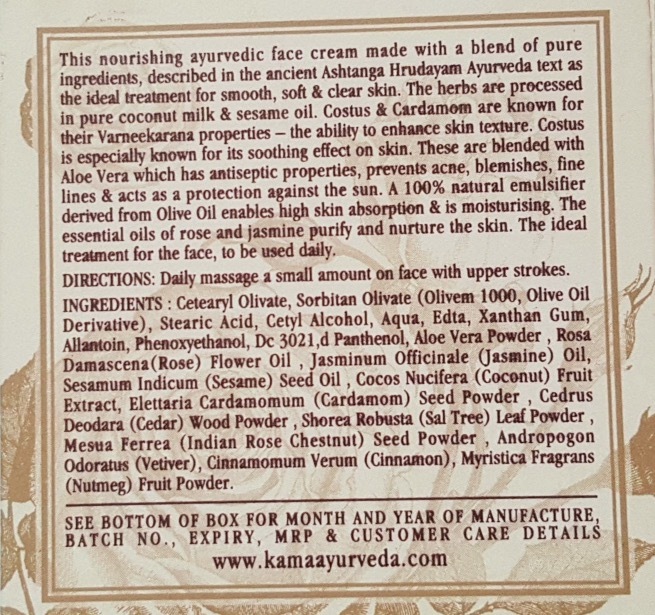 You can also buy it from Kama’s official website Kamaayurveda.com. 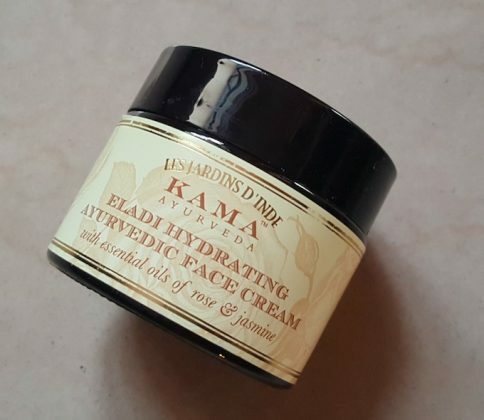 My Experience: Kama Eladi Hydrating Ayurvedic face cream comes in an off-white color and has a thick consistency. It has an amazing mild floral fragrance that instantly relaxes the tired mind and you’ll feel rejuvenated & refreshed. After cleansing and toning my face I take a pea-sized quantity of this cream and massage it nicely on my face & neck. Despite its rich texture, it spreads easily, however you need to massage it for good 2-3 minutes to sink it completely into the skin. 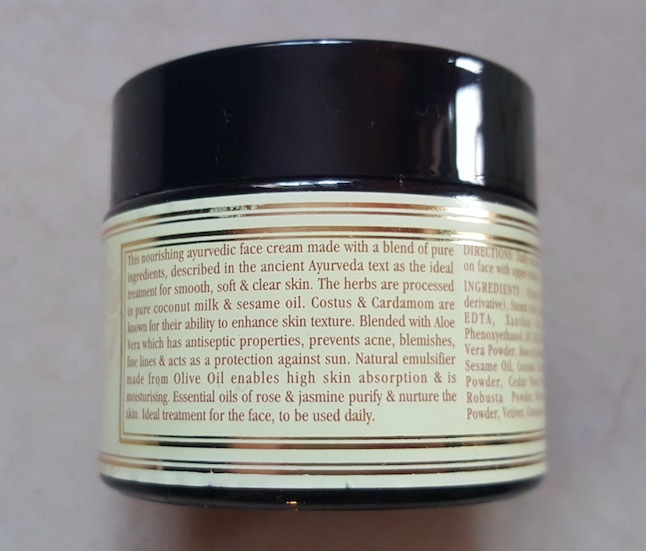 It moisturizes the skin really well leaving my skin feels soft, smooth and nourished. I bought this cream 6 months back and I stopped using it after 2-3 usages as it was making my combination skin a little greasy during the summers. I started using this cream 2-3 months back as my skin was feeling slightly dry due to cold weather. It provides enough moisture and keeps my skin hydrated throughout the night and I wake up every morning with a healthy looking skin. It is a day cream but I prefer using it only during the night time for intense hydration. I have acne on my face and fine lines around my eye area and I’ve not seen much improvement in these. 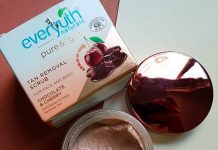 It did make my skin smooth, soft and bright but it did not help in preventing acne and fine lines. Honestly, I was not expecting any miracle from this cream in a span of just 2-3 months. This cream is a blend of natural ingredients, so it does take time to show some visible results. A product from a well-known and trusted Ayurvedic brand. 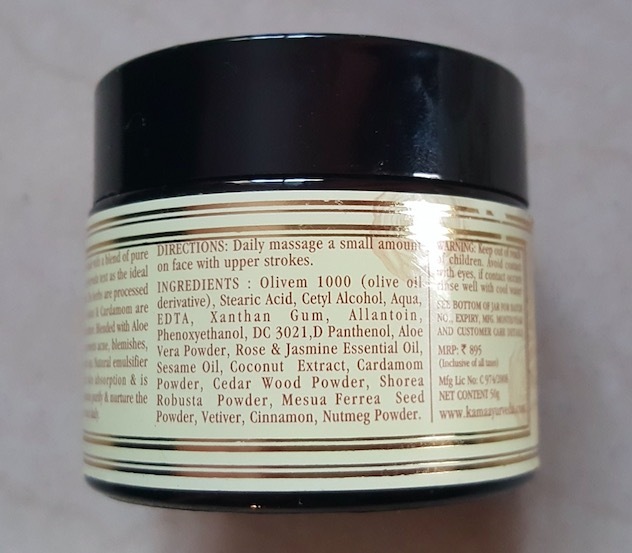 It is infused with a blend of pure ingredients like Coconut Milk, Sesame Oil, Costus, Cardamom, Aloe Vera, Olive Oil and pure essential oils of Rose & Jasmine. A rich face cream that instantly moisturizes the dull & dehydrated skin leaving the skin soft, supple and nourished. It provides intense hydration without feeling greasy and is a perfect face cream for dry skin and winter season. It comes with a very calming and soothing aroma. It is ideal to use by both men and women. A value for money product and the quantity provided for its price is good enough to last for up to 3 months. 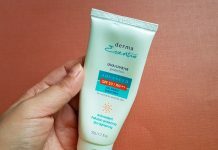 It didn’t cause any breakout to my sensitive, acne prone skin. It is 97.5% natural and free from harmful chemicals. Some people might find a jar packaging unhygienic (personally, I don’t mind it) and also the glass jar is prone to breakage. Not suitable for people with oily skin as it can leave a greasy feel especially during the summers. 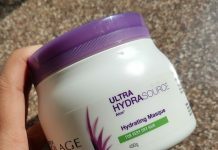 Though it is mentioned in the product description that it provides sun protection but the SPF rating is not mentioned anywhere, neither on the product nor on their website. 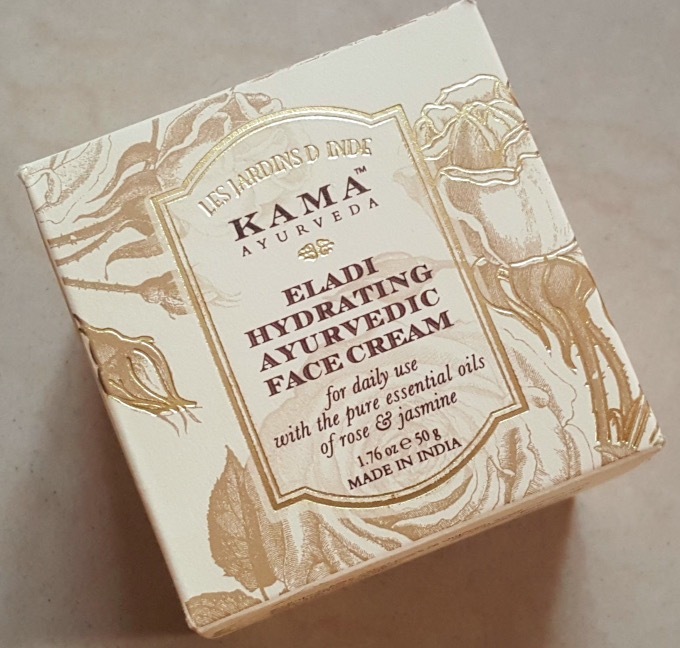 Overall I loved this Eladi Hydrating face cream from Kama Ayurveda. It is a blend of pure natural ingredients and it not only moisturizes the skin well but also makes the skin smooth & bright with regular usage. 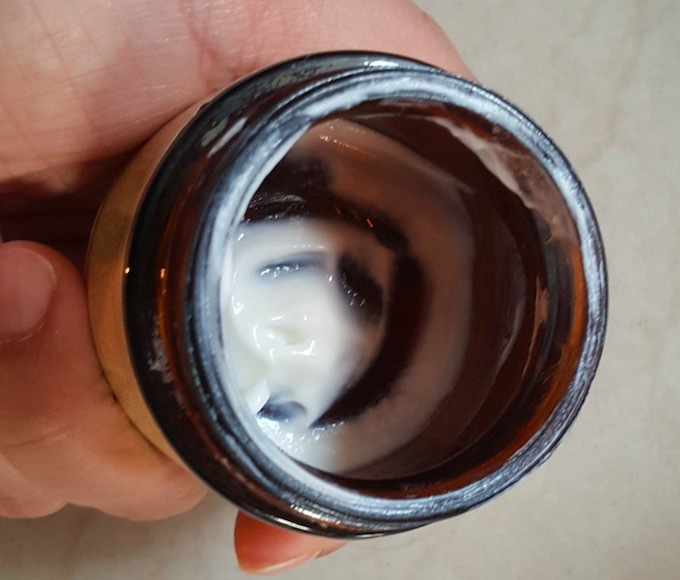 I will definitely repurchase this cream during the winter months as it is one of the best moisturizing cream I've used so far. I will highly recommend this face cream for dry to extremely dry skin however, oily skin people can skip it during the summers. I know it is a little expensive in comparison to other brand's creams but trust me it is worth spending some extra money for such an amazing product.